Industrial cast iron and natural solid hardwood are paired together to create a stunning centerpiece in our Lahoma Dining Collection. Crafted by hand, this hardwood dining table features a planked top and breadboard ends, available in a variety of sizes to suit any space. Below, two solid cast-iron legs provide a sturdy base, displaying proudly "Made in USA" on each side. 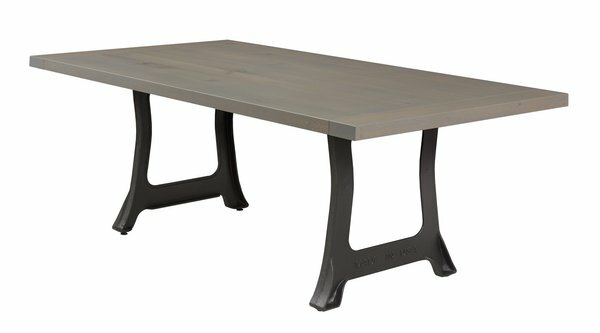 When combined, the Lahoma table offers the perfect take on the industrial-chic style, adding charm from any angle. Choose from a variety of size, wood, and finish options for the 2" thick top - adding your personal touches to the finished look. You can add more depth by adding the rough-sawn v-groove option to the top or choose a hand-planed finish for a classic look. Paired with the Lahoma bench, chairs, and wine server to create a unique set that is sure to make your dining area shine. Questions? Call one of our furniture specialists today to answer your questions on the Lahoma dining collection. Backed by a 20-year warranty, you'll be sure to have many years of continued service from your new dining collection.